SunButter Sunflower Butter is free from the top 8 food allergens and perfect for snack time or anytime. SunButter is made in the U.S. from locally-grown, specially-roasted, GMO free sunflower seeds, which are processed in a dedicated peanut free and tree nut free facility. With 7G of protein per serving, SunButter is a delicious solution for families with peanut allergies, tree nut allergies or other food allergies. 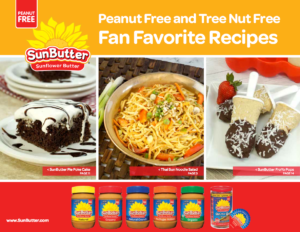 Includes 15 peanut free and tree nut free fan favorite recipes (submitted by SunButter fans), featuring snacks, meals and treats. Or check out our other SunButter Recipe Books including the SunButter Snack Recipe Book, SunButter School Safe Recipe Book and Foodservice Recipe Book for School Cafeteria or Foodservice Departments. 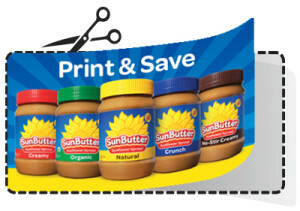 Valuable savings on SunButter. Coupons available for U.S. and Canada.